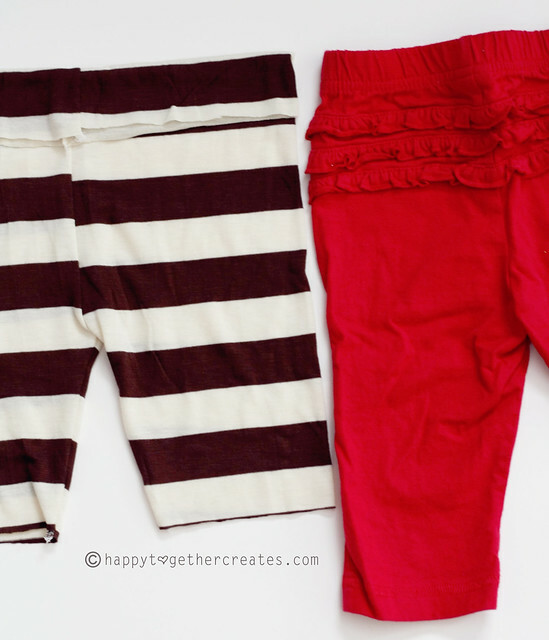 I have made a few pairs of ruffle pants in the past and I have always had requests for a tutorial. (This tutorial is how I made the ones here.) So, this week I’m going to share both ways that I make them starting with this one. (See? I am getting around to all of the tutorials I have promised…..all in good time :). But before we begin the tutorial, let’s take in the cuteness that is miss E. When she isn’t teething, hungry, or gassy, she’s usually a very happy little girl. Her eyes just light up when she laughs and it’s so genuine. I love it! And I love her in this little outfit. So let’s start this tutorial thing now. This is written assuming that the very basics of sewing are known. If there is something you don’t understand, please feel free to ask a question and I can answer it. Or you can search the internet for terms you might not know or understand. I make my own pattern using a pair of pants that already fits the little one, but use an actual pattern if you prefer or need to. 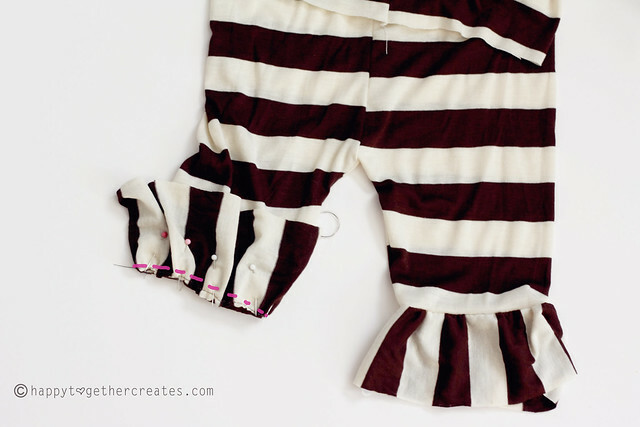 Also, this tutorial is based on using knit fabric, but it can be done with regular cotton fabric as well. Just make sure to use a pattern that supports that type of fabric or use pants that are not knit (like non stretch jeans or khaki’s) to create it. Also, if you aren’t used to knits, I suggest researching them a bit. They need a knit needle or you will get super frustrated while sewing. You will also want to practice sewing on the fabric first to make sure you find the right stitch you like for that type of knit. I’ve found some do better with long stitches, while others need shorter stitches. 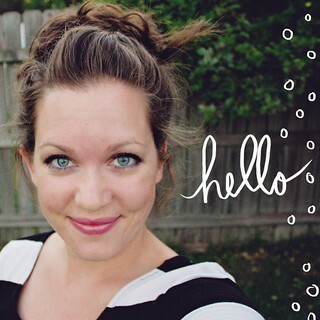 -elastic (I suggest either a 1/2″ to a 1″ size; but I used 1/4″ because that is what I had. If it works it works 😉 Pants for older children would do best with a larger elastic. 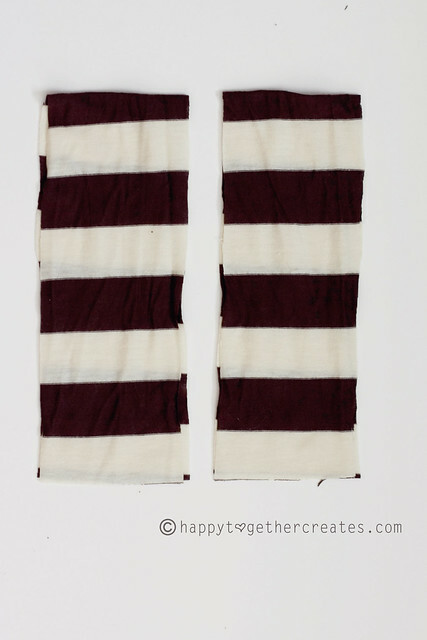 So grab yourself some knit fabric and create a fold, making sure the fabric stretches horizontally. Fold the pair of pants you are using as a guide in half. Place them on the fold so that the sides of the pant legs are on the fold and the crotch side is on the other. 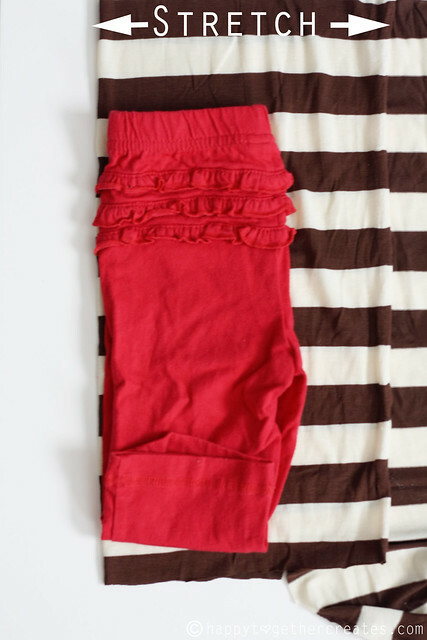 Fold up legs to where you would like the ruffle to be. 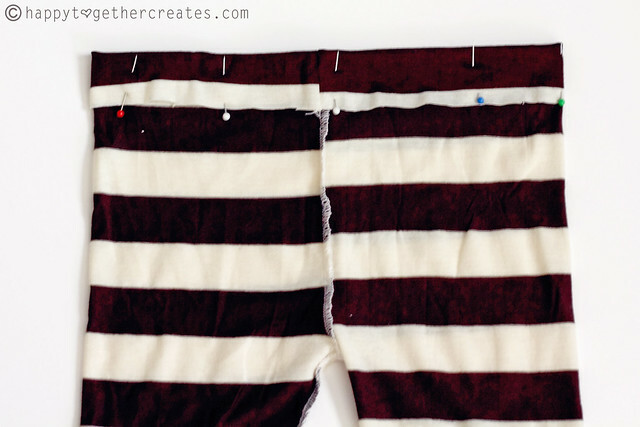 Cut around the pants, leaving room for seam allowance and leave extra at the top for the waist to be folded down to create a casing for the elastic. You will also make sure the waist is further out as well, since it’s pulled in the already made pants. You will need to cut 2 just like this. I simply used this 1st cut piece to cut the 2nd piece so they were the same size. 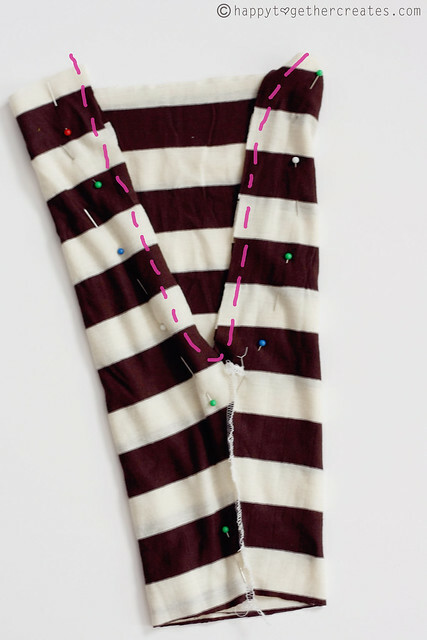 Now you will need to sew the leg part of each pant leg. Make sure fabric is right sides facing and sew. Repeat on other piece as well. Keep one pant leg wrong side out and the other right side out. Slip one into the other, right sides facing, having them match up on the leg seam you just sewed. Pin together. Sew pants together around the area shown above. This is the crotch area. Turn right side out and see how you are doing. Here I folded down the waistband area so the top of the pants was the same length as my example pair just to double check everything. Now measure the length of the bottom of the leg. Take this number and multiply it by 4. That is how long you want to cut the ruffle. You determine the height by measuring how much of a difference is in the legs compared to the length of the already made pair you used to create the pattern with. 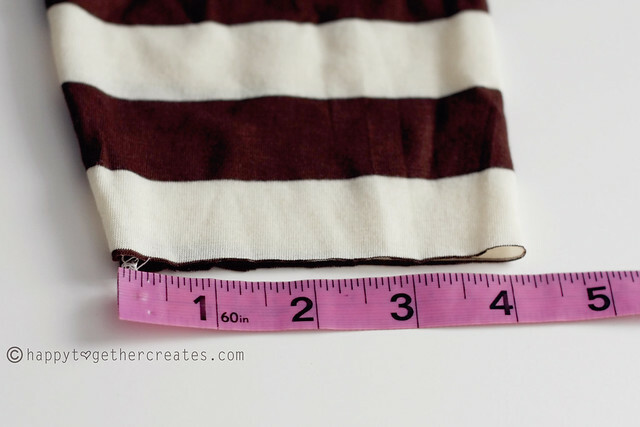 Make sure to add at least .5″ seam allowance. Cut two pieces for the ruffles. It doesn’t matter about the stretch at this point, so cut it how you like to. Then sew the ends of the ruffle together and baste along the top (baste meaning: do not back stitch and use a large stitch). Pull the bobbin thread to make it to ruffle. 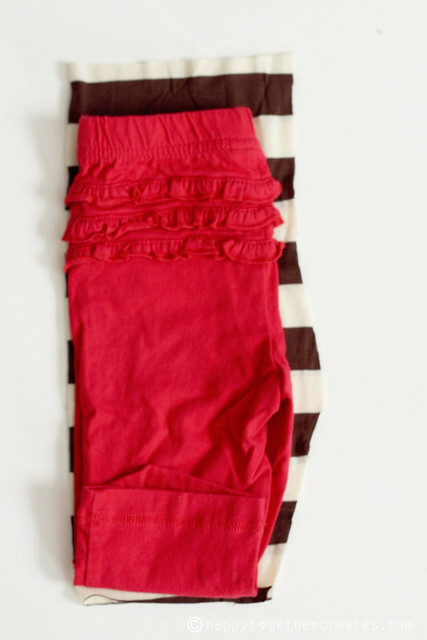 Place the ruffle piece on leg bottom, right sides facing. Even out ruffle and pin in place. I also match up the ruffles seam to the pants leg inseam. 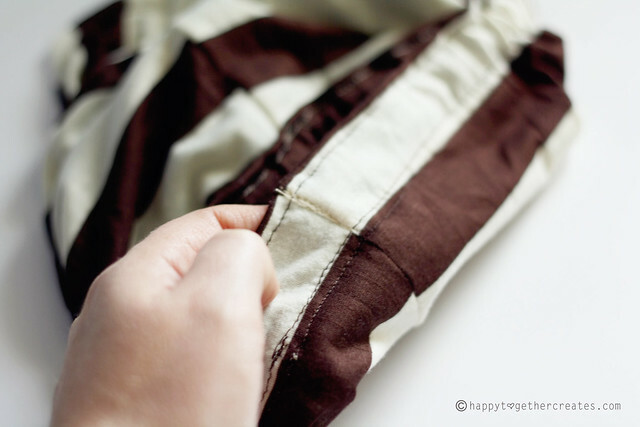 Sew together and trim any extra fabric off at the seam that you like. Turn the ruffle down and make sure everything looks good. I leave the bottom edge raw, but you could finish it off however you like. 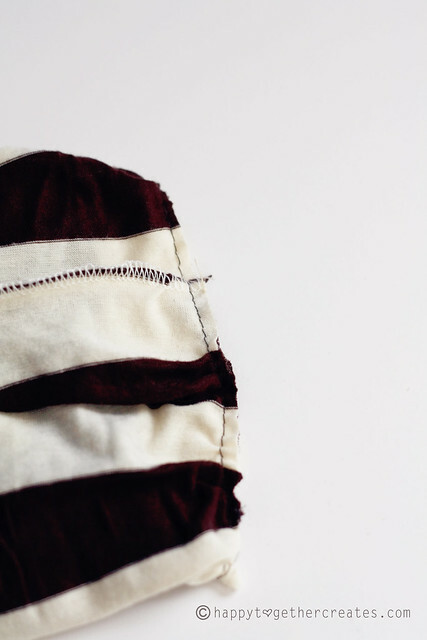 Another step you could do, is push the seam (from where the ruffle meets the pants) up and sew it in place. Now turn the pants wrong side out again. 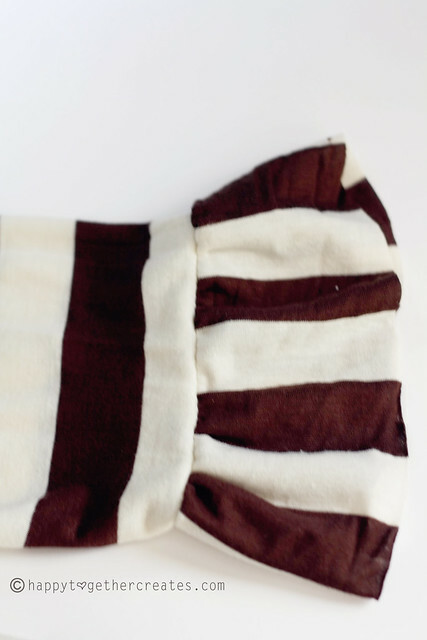 Push the top down to create a waistband. Make sure to match it up with the pants you used to make sure it’s the right length. Then pin in place. You are going to sew in at least two places, I chose three. Sew around the very top of the waistband first, just about 1/4″ down. This helps keep the elastic in place. Then sew further down, all the way around, making sure to leave an opening for your elastic. 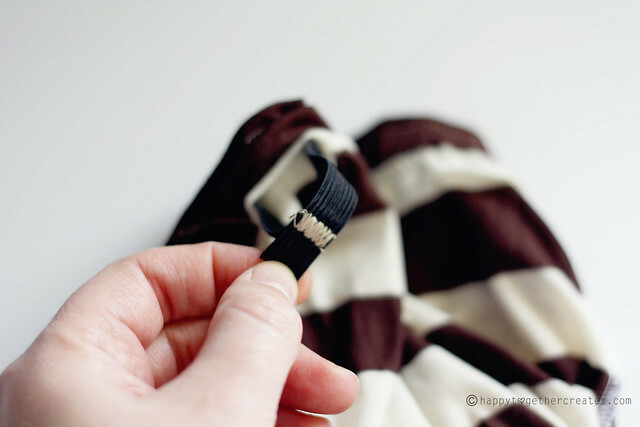 Make sure that the second line you sew leaves enough room for the elastic to fit. 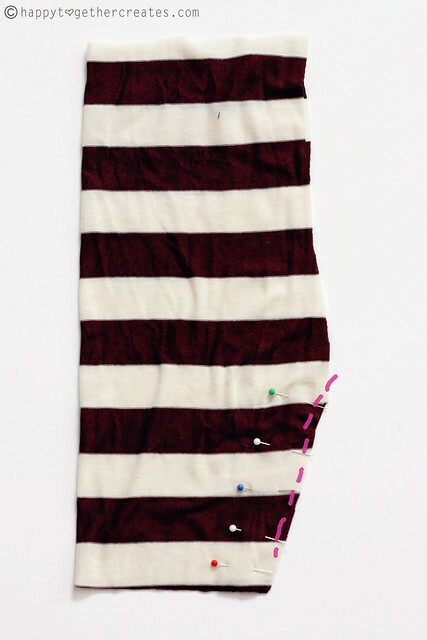 For example, if using 1″ elastic, you would want to sew 1.25″ down from the first top stitch you did. I’ll be honest. I used a very thin elastic because that is what I had. I do suggest using at least 1/2″ elastic. To determine the length of elastic, measure child’s waist and subtract one inch. Then take a safety pin and attach to one end of. 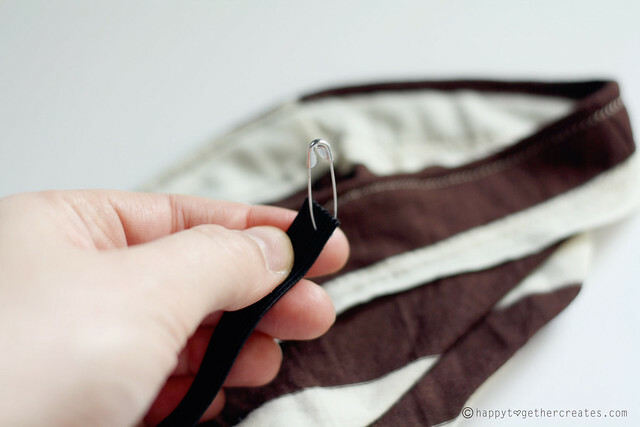 Slip in safety pin end into the opening you left when sewing the waistband. Pull it all the way around until it comes out the other side, making sure that the non-safety pin end doesn’t get pulled into the waistband casing. 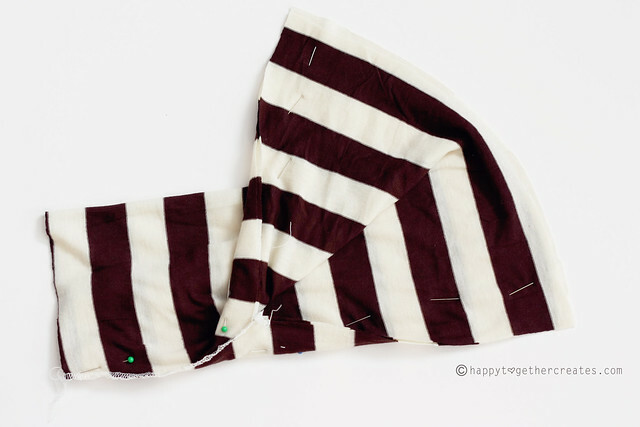 Lay one end of elastic on top of other and zig zag stitch together. Make sure that the elastic isn’t twisted up or anything before sewing together. 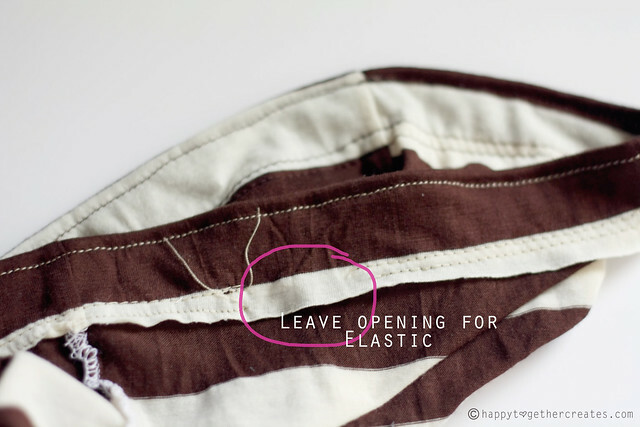 Pull elastic inside of casing and sew opening closed. Then sew elastic down in the middle back to keep in from getting twisted up during wear and washing. wow¡¡¡ hermoso, gracias por el tutorial. 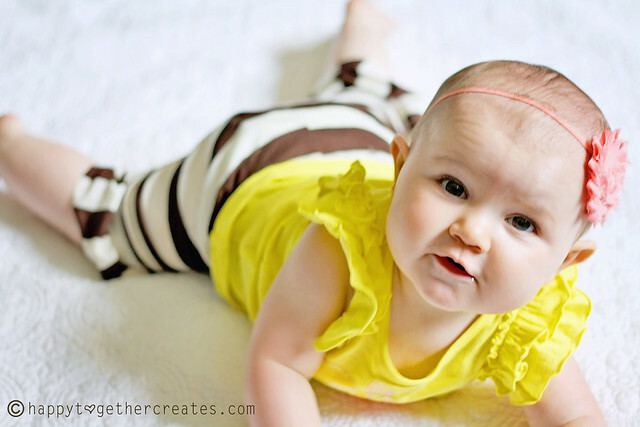 Miss E is such an adorable baby – she’s soooo cute!!! Thank you so much for this post. I want to let you know that I posted a link to your blog in Creative Busy Bee Craft Inspirations, under the Page 6 post on Aug. 12, 2012. Thanks again. Love to do these in adult version! ! As an avid sewer and previous design assistant, I can just say with a hint of foreshadowing that this will be a season hit!